Waste not, want not. We believe in this, when you want to build an energy efficient building. Waste not, want not, is an old phrase that we associate with household rubbish and food consumption. But it can certainly apply to many more things in our lives. We’ve opened up our Superpod® a couple of times in the last 2 weeks. Once for International Passive House Day. It was exciting to be part of an international project, where all around the world, on the same weekend, people let the public into their homes to see and feel the passive house difference. Then we had a Sustainable House Tour run by the local Bass Coast Shire – it’s great to have Council support for sustainable living and healthy environments. We talked about carbon footprint and embodied energy – with the comparison being made between stick timber frames and steel frames in our Superpod®. The assumption is that timber is good, and steel is not. Ah, it’s not the whole picture I said! (Believe me, I think about this a lot.) What’s the whole picture? You might ask. I can’t tell you the whole picture in one blog, but I can paint a bit more of the landscape. Basically, it’s about greenwashing. Even our favourite tv presenter Kevin McCloud talks about avoiding the greenwash. First, we can use timber frames, so it is about choice. Our Superpod® can be utilised for a range of building types, whether high rise, warehouse, office, church, school, child care centre, or hospital. You don’t tend to see thin stick frames as the main structure on these sorts of buildings because they are not strong enough. CLT (cross laminated timber) is starting to become fashionable in some pockets in Australia, and this is certainly an option in passive house buildings (although CLT by itself does not give you all of the airtightness and insulation needed for a super energy-efficient passive house). But you need to bear in mind that for remote builds, transportables, and areas where termites eat the frames, you will often need steel anyway. You can’t easily transport buildings on stick frames. You can’t keep the termites off them either. So your consideration of how to minimise your carbon footprint is quite complex, and needs to take into account all requirements of your project. A normal site built house might take 9-10 months to build. 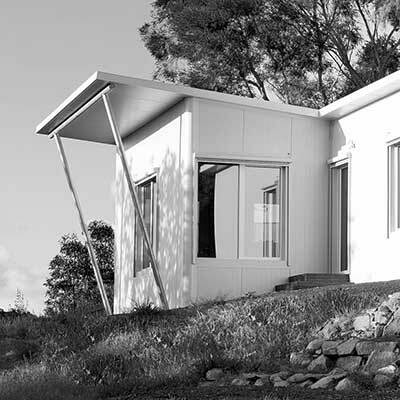 A Superpod® equivalent might take 6 weeks, in part because of the pre-designed, pre-fabricated (prefab) , beautiful steel frame. Who takes into account the carbon emissions of all the cars and trucks and utes going back and forth to site in the long build? A proper comparison between building systems should do so. For us, we recognise the massive carbon saving in having a fast, lean build time with less materials and less transport. And more still. What about waste? All of this needs to be taken into account, rather than simply comparing one material with another. But there’s another point. I almost forgot! Of course, there are the key benefits of passive house – up to 90% less energy for the life of the building. Year after year after year. Other buildings are pumping out carbon continuously (heating, cooling, wasted air leaking out). Not so the passive house. That’s incredible! Energy use? It’s practically nothing! Now that’s an immense benefit to the environment. As well as for the occupants themselves. There’s the most amazing reduction in carbon footprint. It means that we can focus on the lifetime of the building, and the lives of those who live in it. Not just on the materials used to construct it. That’s why Brussels has made Passive House mandatory. That’s why passive house of any kind is a key to our low energy future.